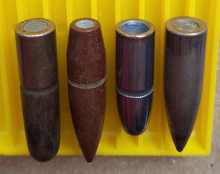 These .30-caliber (7.62 mm) full metal jacket bullets show the typical jacket openings exposing the lead alloy core on the base of the bullet to illustrate a full metal jacket may not completely enclose the core. A full metal jacket (FMJ) bullet is a small-arms projectile consisting of a soft core (often lead) encased in a shell of harder metal, such as gilding metal, cupronickel, or, less commonly, a steel alloy. A bullet jacket generally allows for higher muzzle velocities than bare lead without depositing significant amounts of metal in the bore. It also prevents damage to bores from steel or armor-piercing core materials. In military nomenclature, it is often labeled ball ammunition. The bullet was invented in 1882 by Swiss Colonel Eduard Rubin while he was working for the Swiss Federal Ammunition Factory and Research Center, which developed ammunition for the Swiss military. The use of full metal jacketing in military ammunition came about in part because of the need for improved feeding characteristics in small arms that used internal mechanical manipulation of the cartridge in order to chamber rounds as opposed to externally hand-reloading single-shot firearms. The harder metal used in bullet jackets was less prone to deformation than softer exposed lead, which improved feeding. It is sometimes thought that military use of FMJ ammunition was the result of The Hague Convention of 1899, Declaration III, prohibiting the use in international warfare of bullets that easily expand or flatten in the body. However, jacketed bullets had been in use since at least 1882, over a decade prior to the Hague Convention. By design, fully jacketed projectiles have less capacity to expand after contact with the target than a hollow-point projectile. While this can be an advantage when engaging targets behind cover, it can also be a disadvantage as an FMJ bullet may pierce completely through a target, leading to less severe wounding, and possibly failing to disable the target. Furthermore, a projectile that goes completely through a target can cause unintentional, collateral damage downrange of the target. The bullet design inspired the title of the film Full Metal Jacket (1987), by Stanley Kubrick, Michael Herr, and Gustav Hasford. ^ Huon, Jean (1988). Military Rifle and Machine Gun Cartridges. Alexandria, Va.: Ironside International. ISBN 0-935554-05-X. OCLC 24498827. ^ Holt Bobinson (November 2008). "The model 1911 Schmidt Rubin: the other Switzer". Guns Magazine. Archived from the original on 2012-07-15 – via FindArticles.com - CBS Interactive. ^ Wood, J. B. (2003). The Gun Digest Book of Firearms Assembly/Disassembly: Centerfire Rifles, Volume 4 (2nd ed.). Iola, WI: Krause Publications. ISBN 0873496310. OCLC 52359378. "Declaration (IV, 3) concerning Expanding Bullets". UMN.edu. International Peace Conference at The Hague, which entered into force on September 4, 1900. 1899. "European Ammunition Box Translations: FAQ". Rawles.to. "Photos showing terminal effects of British Mark 7 .303 bullets". TheBoxTruth.com.